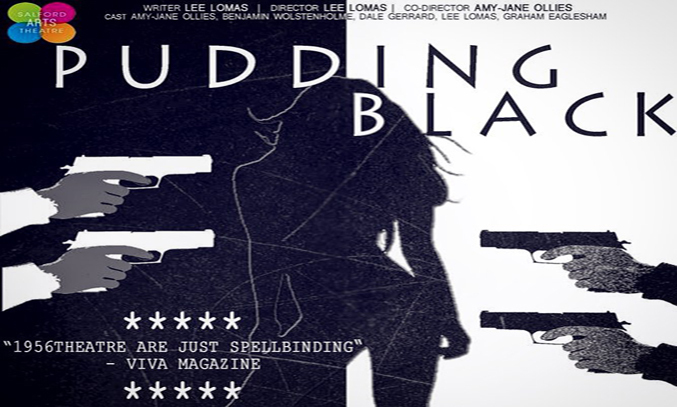 Sharp, shady and tantalisingly stark, Pudding Black is an uber dark comedy with a murderous twist. It follows two policemen Damian (Lee Lomas) and Nelson (Graham Eaglesham) as they investigate the mysterious death of a young woman named Carys. In the first half of the play, the audience are taken back in time as we watch the events that led up to Carys death. Initially our suspicions lie with her angry teenage brother Cal (Dale Gerrard) or her increasingly abusive boyfriend Jason (Ben Wolstenholme) but as the play develops, the characters start to intertwine and a web of deeply destructive relationships begin to unravel. As with his previous work, Lee Lomas’ writing is on top form with Pudding Black. Dark, witty and ingeniously clever, Lomas’ contemporary take on the classic ‘whodunnit’ cleverly fuses intrigue and suspense with modern day dialogue and black comedy. The script is well-written and is predominately character led, with plenty of twists to keep you guessing right until the very end. Amy-Jane Ollies is excellent as Carys, the unfortunate victim who, as we discover, has a few past secrets of her own. Dale Gerrard is equally good as her younger brother Cal, as is Ben Wolstenholme as her boyfriend Jason. But the true stars of the performance are Lee Lomas as Damien and Graham Eaglesham as Nelson, the two policemen investigating the murder. The dynamic between the two actors is infectious and where it is scripted, the comedy is tight, funny and well-timed. The staging of the production is also worth a mention. I particularly liked the way lighting was used to differentiate between different time periods and how the actors addressed the audience at the end of the play as the murderer is revealed. Dark, devious and deliciously entertaining, Pudding Black is bold, ambitious and innovative piece of theatre that’s well worth the ticket price.